This is not a paragliding story about one of our flights. It's a gesture to remind all of us to thank our veterans every day of the year for making it possible for us to have free flight. 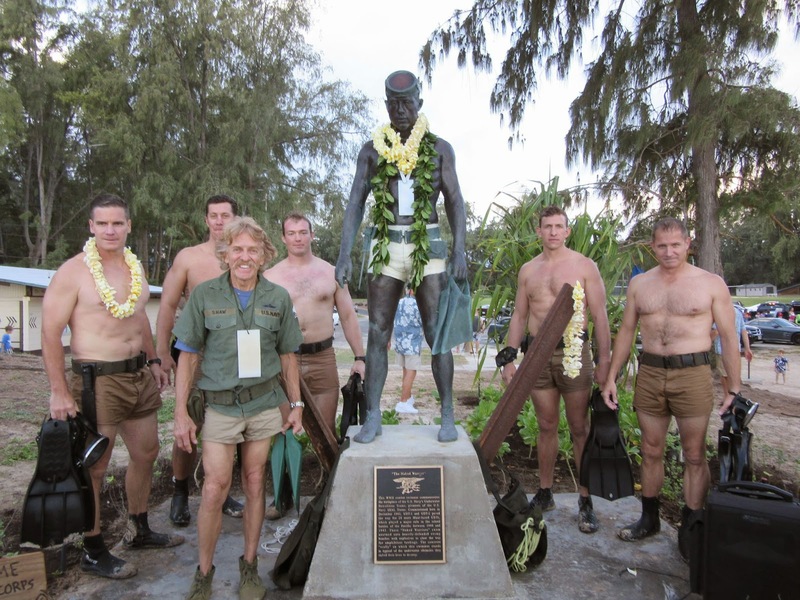 Yesterday there was a dedication of a statue for the Navy Seals at Bellows. One of our favorite frequent paragliding visitors, Laddie Shaw, was there to represent his unit of the Navy Seals. I copied the following from the Navy Seal Foundation web site so we would know a little about the new statue that was commemorated on Veterans Day at Bellows Beach. It is a little known fact that the precursors of today's Navy SEALs, Underwater Demolition Teams, originated on windward Oahu at Waimanalo Beach. In 1943, two years after Pearl Harbor, as WWII raged in the Atlantic and Pacific, UDT 1 and UDT 2 were formed at Waimanalo, using Bellows Air Base as their initial training area. A few months later, they moved to Kihei, Maui. However, the origins of UDT were at Waimanalo, a fact memorialized in the oral histories of frogmen who were there, and recently verified by the UDT/SEAL Museum in Ft. Pierce, Florida. Years ago, the Museum commissioned this bronze "Naked Warrior" statue to represent the various combat swimmer units which developed over time into today's Navy SEAL Teams. He stands on a "horned scully", one of the many obstacles UDT's were assigned to destroy so that amphibious landings could take place from Normandy to Iwo Jima. It is a fascinating story of bravery against all odds. The Hawaii Paragliding Association thanks all our veterans. Our membership alone is loaded with veterans that served and are still serving, and we are honored to have them in our family of flying monkeys. Special thanks to two of our veterans, Pete Michelmore and Annette Judson Nicosia, along with my wife Donna Therrien, for representing the HPA at this dedication. Now, It's Time To Fly, Get Your Gear and Thank a Vet, for the Freedom to Go!! What a great event. It was very special to see Laddie and his former Seal / UDT teammates holding the ceremony at Bellows beach where it all started over 70+ years ago. Laddie was actually dressed in WWII UDT gear. The guys in the photo represent UDT warriors in traditional UDT swimwear, hence the name "Naked Warriors".